For a prospective TDAA judge I assembled a document containing three distinctly different variations of the game Dare to Double in order for her to understand how the game might be played. My original objective was to find on my computer an example of the game with a “robust” briefing. And of course I stumbled across two interesting variations. Example #1 is a course design and briefing from a trial I judged in August of 2009. This is the most common version of Dare to Double. What makes it distinctive is a rule declaring that “A warning whistle is blown 15 seconds prior to the expiration of time.” Of course the table isn’t live until that whistle blows. This is a favorite game in the TDAA. The most canny competitors have a doubling strategy for the opening; and a rule-of-thumb strategy for the last 15 seconds. If this variation has a down-side, it is that fast dogs with excellent A-frame skills (and a handler who gets the math) will always rule the game. Example #2 features a variation of Dare to Double designed by TDAA judge Victor Garcia. 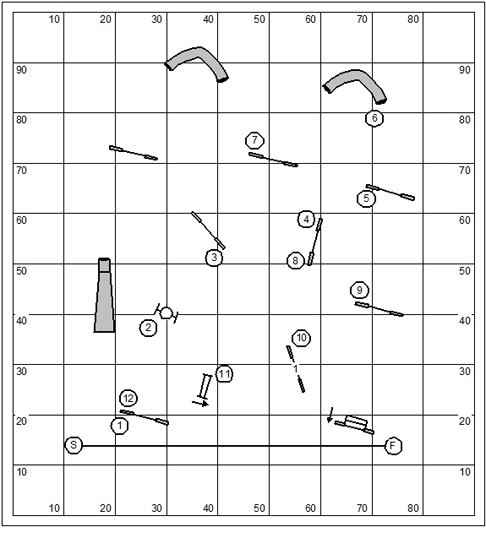 This game was played in competition at the Petit Prix Warm-up Workshop held in conjunction with the 2013 Petit Prix in Latrobe, PA, and using the rules of the Petit Prix. What makes this different from the “common” version is that there is no warning whistle. And so the competitor is left with trusting to an internal clock as to when to go to the table. But to tell the truth this version exposes and encourages the popular “Double ’til the end of time” strategy. The essence of the strategy is to work on doubling ’til the bitter end, and don’t go to the table, accepting the loss of half the points as a push. Example #3 and last example is the “Flanigan” variation of Dare to Double. In this variation the dog is limited to two performances of the doubling obstacle; introducing an amazing challenge of timing strategy. Doubling ’til the end of time isn’t a good option. This variation offers the possibility that good timing and performance might very well prevail over speed. Dare to Double is a simple dog’s choice game, which means that he will earn points for taking obstacles in the order and direction of his own choosing. The team has 50 seconds to accumulate as many points as possible. The game begins at a start line designated by the judge and ends at the table. If the dog gets to the table before time expires, he keeps all points, if he fails to do so half the points are lost. Scoring obstacles can be taken only twice for points. Back-to-back performances are allowed. Jumps that are knocked down will not be reset. The A-frame has a special value (Note that the A-frame was not included in this list above). It is the doubling obstacle. During the run, a handler may double his current points by performing the doubling obstacle. A successful performance doubles all points earned up to that time. If, however, the dog faults the A-frame, then the dog loses half of his existing points.The dog may double points any time, as many times as time allows. The only restriction on doubling is that the A-frame cannot be performed back-to-back. The dog must do another obstacle, for points, before attempting to double point values again. A warning whistle is blown 15 seconds prior to the expiration of time. The objective is to score as many points as possible in the given time: 12″–16” dogs 50 seconds; 4″–8“ dogs 55 seconds. The table stops time and is live at all times. A dog arriving at the table after time expires is “Faulted” half of all points. Jumps are 1 point; Tire and Tunnels 3 points; Dog Walk, Teeter and Weaves 5 points. Obstacles can only be taken twice for points. Back to back performance is permitted. The A Frame is the Doubling obstacle: During the run a dog will earn “Double” all points by successfully performing the A Frame. On a missed down contact on the A Frame, the dog is “Faulted” losing half of all points. Points can be doubled at any time and as often as the handler wishes. The A Frame is eligible for doubling only after any other point has been earned. When the A-frame is not eligible for doubling the dog may still Fault half of points in the performance. The game begins at the designated start-line, and ends at the table. Big dogs have 50 seconds to accumulate as many points as possible; Small dogs have 55. The dog must get to the table before course time elapses. If the dog gets to the table before time expires, he keeps all points accumulated on course. If the dog fails to do so, half of the points are lost. There will be no warning whistle. If the dog hits the table at any time during the run, scoring and time will cease. Obstacles can be taken only twice during point accumulation. Back-to-back is permitted. Jumps that are knocked down will not be reset. Jumps = 1 point; tunnels and tire = 3 points; contact obstacles and the weave poles = 5 points. During the run, all current points can be doubled by performing the A-frame. A successful performance doubles all points. If, however, the dog faults the A-frame, half of the existing points are lost. In the Flanigan Variation the A-frame can be performed only twice during the dog’s run, and an obstacle must be completed for points between each performance of the doubling obstacle. Dare to Double is scored Points, Then Time. 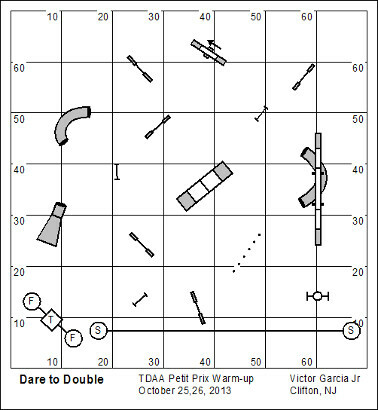 In the traditional Dare to Double you can double as often as you want, so long as you score points in between performances of the A-frame. The savvy player will quickly get the fundamental underlying math. Basically you get a handful of points on your dog and then start doubling until the end of time. But the Flanigan variation is something else entirely; you only get to do the A-frame twice for double points. Now, if you double too early it lowers your capacity to score the most points. If you double too late time may expire and you’ll lose half your points. It is certainly a canny game of timing. The game to be played as the final round of the TDAA Petit Prix, our national championship tournament will be Jumpers. This is a game that doesn’t need much of an introduction as it is a popular format played by every agility venue in the world. The Game Within the Game at the Petit Prix (you’ll have to see tomorrow’s blog) is the steadiness and overall performance of a dog in this competition. In a departure from all years previous there will be no elimination of dogs from the competition for falling below some arbitrary set-point of accumulated score. That means every dog will compete in every competition. And, mind you, this is not a winner-take-all round. At the 2012 Petit Prix the top 40 dogs will be set aside for a final showcase run on the Jumpers course. They will be run by jump height in reverse seed order. This round will be theirs to win or lose. It’s possible, and actually somewhat likely, that some of the exhibitors sitting as spectators during the showcase round will move up into the top 40 on the basis of their performance in the final round. The Jumpers class measures a dog’s ability to jump and turn and the handler’s ability to exert control and timing in this fast-paced version of the agility game. Though the dog only needs to learn to jump to begin competing, Jumpers is one of the most difficult games to perfect as dogs move at a much greater speed than in other classes. Jumpers courses consist only of hurdles and tunnels, with some limitations between the different venues. The dog is required to run the course in the sequence indicated by the judge. Follow the numbers. And keep the bars up. Jumpers is judged according to the performance rules for the respective venue. Jumpers is usually scored Faults, Then Time the winner being the dog with the fewest faults. If two dogs have the same number of Faults, Then Time breaks the tie. Jumpers can be scored Time, Plus Faults. The winner would be the dog with the lowest score. This is an example of a USDAA Masters course. 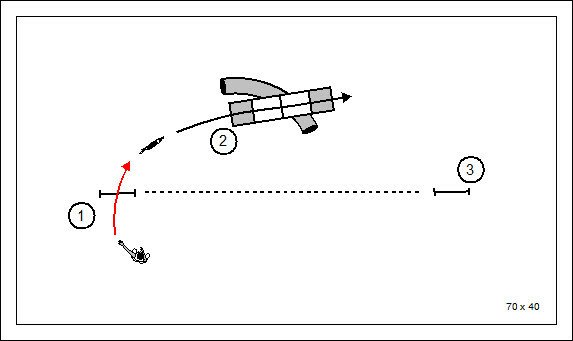 A USDAA course requires the performance of at least three spread hurdles. These courses are not inconsequential in terms of challenge and handling. You’ll see options and traps and the need for excellent timing and deft handling. 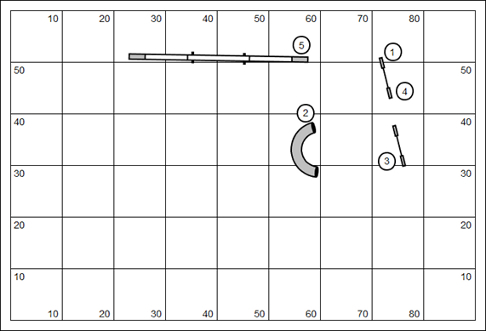 This is an example of a Novice course. Note that it is nested perfectly with the Masters course example. 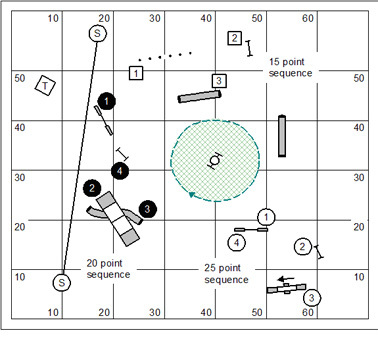 The course designer may want to move out unused obstacles so that the lower levels are not presented with “dummy” jumps. Excepting play in the AKC (and possibly in USDAA Team/PVP) only tunnels and hurdles may be used on the course. As the level of competition rises, so does the complexity of the course. In addition, as the level of competition increases, the time to perform the course decreases. 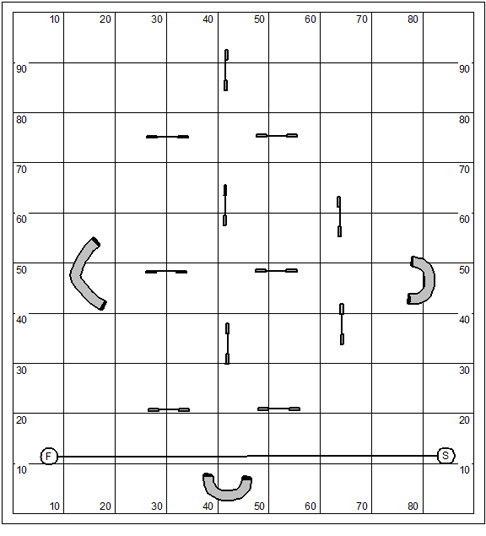 This is an example of a Jumpers course designed for play in the TDAA. The spacing between obstacles is considerably tighter than in any other venues. What’s worth remembering about the TDAA is that it is intended for dogs of small stature. And so the Jumpers course especially emphasizes the central idea of the TDAA, to present to the small dog handler challenges that are comparable to what big dog handlers face on any given weekend. This is an example of an important variation of Jumpers called, appropriately, Jumpers With Weaves. The performance standard for AKC Excellent Jumpers With Weaves requires an unflinching mastery of the course. 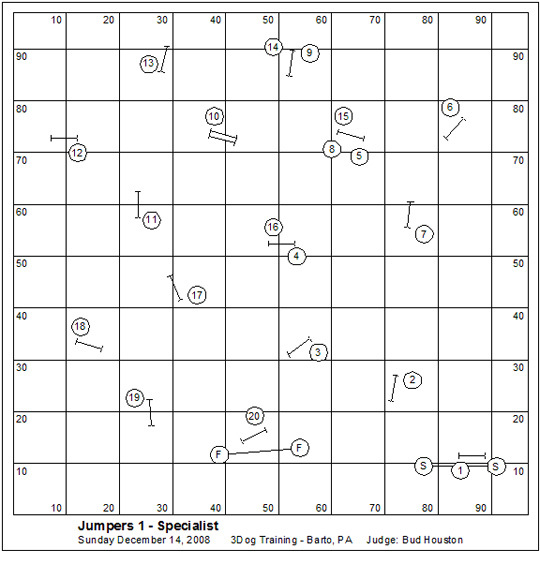 This is an example of a DOCNA Jumpers course (arguably it would be suitable for NADAC as well). You’ll note that DOCNA does not use tunnels, and all of the jumps are wingless. 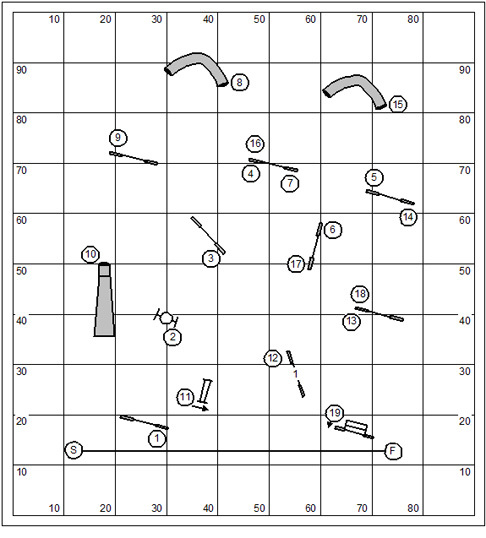 In the NADAC-style venues the courses are devoid of challenges that are routine in venues like the USDAA, AKC, and TDAA; you’ll find no options, or traps, hard-about turns, or wicked handling moments. Everything is flow and go. As a consequence, the rates of travel for NADAC and DOCNA are more aggressive and demanding than in any other venue. The basic advice in the Jumpers class is to follow the numbers, and keep the bars up. 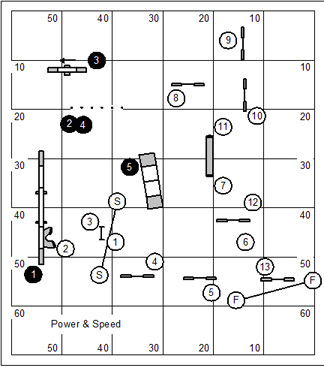 Since only jumps and tunnels (where allowed) are used, Jumpers courses tend to be more difficult for handlers to memorize than other types of courses. To be successful in Jumpers, it is more important than ever to remember course flow and sequences rather than individual obstacles. Also, the handler’s movement and timing are important on Jumpers courses in the control of the dog as the action is coming fast and furious. The handler should be sharp, and timely. The most common faults in Jumpers are wrong courses and refusal. Thus, emphasis should be placed on considering approaches, angles, and distances to obstacles during the course walk-though. The key strategy for Jumpers is to train the dog to jump and to be responsive to handling in fast and flowing situations. Nearly every venue features Jumpers as a titling class and an element of the respective championship programs. Qualifying is based on the measured length of the dog’s path; usually at considerably more aggressive rates of travel than the standard classes. Whether the scoring basis is Time+Faults or Faults, Then Time, the score must be equal to or less than the established SCT. The lowest score wins. Jumpers with Weaves ~ This format is used by the AKC. In a departure from the Jumpers class in most venues, Weave poles are featured in the jumpers course. 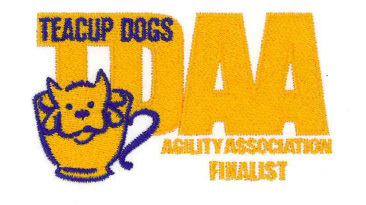 USDAA Dog Agility Masters® (DAM) tournament Jumpers – The format for DAM Jumpers is different from the Jumpers played in USDAA titling classes: 1) weave poles are often included; 2) a refusal is penalized 2 points; and 3) The scoring system is Time, Plus Faults. Land Rover Drive – This game, also known as Jump and Drive, is perhaps a historical footnote. The Land Rover Drive and Jumping contest grew out of the sponsorship by Land Rover for agility trials in the U.K. The handler loads his dog into a Land Rover, drives a designated course, parks the vehicle in a garage and then jumps out to run his dog over a Jumpers course. The judge will designate the starting point for the Land Rover, the path of the vehicle and the garage where the vehicle must be parked. Dog and handler (and the course clock) start on foot across a starting line designated by the judge. Black and Whites – This British variation is Jumpers for black and white Border Collies only (or black and white dogs with any hint of BC in them). Jumpers with Weaves Plus ~ loosely based on the AKC Jumpers with Weaves titling class, but with multiple weave pole challenges. The Purpose of the game is to complete the course in the specified order, as quickly as possible, without faults. 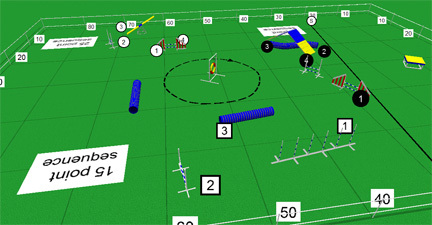 This is an example of a Jumpers with Weaves Plus course (closely based on a course designed by Ilze Rukis for play in the TDAA in Warrensburg, IL on April 12, 2003). Jumpers is a favorite game in the dog agility world. Courses are made up of jumps and tunnels only, so the play is fast and furious. Follow the numbers and keep the bars up. One of the favorite games of the TDAA is Quidditch. It is a game of strategy, skill and daring. It is a game that owns a unique terminology and one that promises to make your brain explode as you work to understand the nuance of rules. Do you remember the first time you played Snooker? It’s kind of like that. Quidditch begins the day on Sunday. It is fitting that this game of skill will be the game that decides what players will be set aside to finish the day to determine our national champions. Hairy Pawter’s Quidditch is the invention of Becky Dean and Jean MacKenzie. The game was played for the first time at DogwoodTrainingCenter in Ostrander, Ohio. The objective of Quidditch is to perform three sequences and attempt to earn a bonus (the Beater) after each. The point values for each of the sequences are 15, 20, and 25 points respectively. Each sequence can be successfully completed only once. The sequences can be taken in any order. The judge will assign Qualifying Course Time (QCT) respective to big dogs small dogs. All levels will compete with the same QCT (as each level has different qualifying points). When time expires the dog should be directed to the table to stop time. In case of a fault the team can immediately reattempt the same sequence or move to another sequence. The three individual sequences can be successfully completed only once. Reattempting a sequence will not earn additional points. When time expires no new points can be earned. Upon the successful completion of a sequence the team will have the opportunity to earn bonus points for a successful performance of a tire; the Beater bonus, for which the team will earn an additional 25 points. At the option of the judge the attempt of the beater may require the handler to remain behind a containment line, making the beater a distance challenge. Refusals will be faulted on the beater (the tire). The initial direction of the dog’s approach to the tire will define the run-out plane of the obstacle for the purpose of judging refusals. If a dog commits a refusal on the tire, the Beater bonus is lost. After attempting the Beater bonus the team should attempt another three-obstacle sequence. Faulting the Beater does not fault the sequence prior to the attempt. A Bludger (wrong course obstacle) performed during the performance of an individual sequence shall result in a sequence fault. No points are earned for the performance of any individual obstacle unless the sequence is not completed due to expiration of time. Performance of a Bludger after the successful completion of a sequence on the way to the Beater (tire) shall be considered a fault of the Beater. The ability for the team to earn the Beater bonus is lost. The team should proceed to the next sequence, or to the table if appropriate. If the wrong course occurs: Bludgers (wrong courses) shall not be faulted: between the starting line and the first obstacle of a numbered sequence; between the Beater and the first obstacle of a numbered sequence; between the Beater and the table (to stop time). No points shall be earned for the performance of any Bludger. If the team completes each of the different three-obstacle sequences, they will earn a ‘Keeper’ bonus of 50 points in addition to the points of the individual sequences. Note: the Keeper bonus is based on the three sequences alone and is not influenced by success on attempts to earn Beater bonuses. If a team successfully completes all three sequences, earns all three 25 point Beater bonuses, and touches the table prior to the expiration of time, the team will earn the Golden Snitch bonus of 75 points. Quidditch is scored points then time. The dog with the most points wins. In the case of a tie, the dog with the shortest time will be the winner. A perfect score requires completion of all three sequences and successful performance of the Beater bonus. The scoring notation would look like this: 15-25-20-25-25-25-50-75. With several years experience in designing and playing Quidditch (both in league play and in the TDAA) the game has evolved into a more interesting game of strategy and daring. 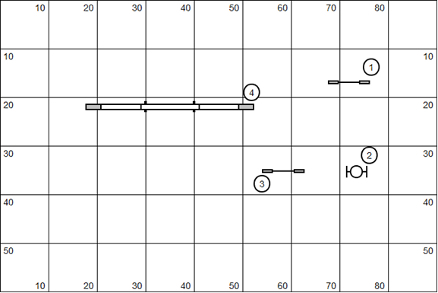 In the early going each of the scoring sequences were typically limited to three obstacles only. This turns out to be not terribly interesting in terms of challenges. 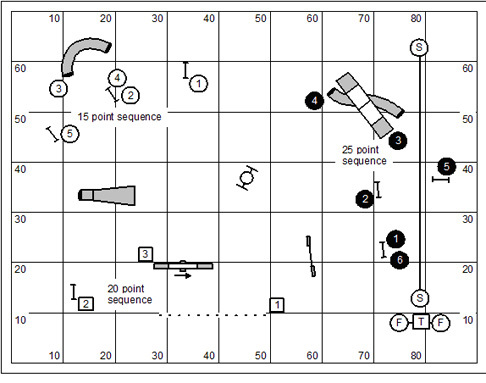 The judge/course designer should be aware that when the length of sequences are expanded the Qualifying Course Time (QCT) might have to be a bit longer. The rational system for applying QCT is to actually measure a modest strategy and then apply the rates of travel used in the standard classes, giving a small fudge factor for transitions between sequences. Considerable thought should be given to the placement of Bludgers between the end of a scoring sequence and on the approach to the Beater. Sometimes the Bludger can be a simple ham-handed trap; and sometimes a subtle nuance of erstwhile scoring obstacles presented to entice the imagination of the dog. The Quidditch course is a matter of some simplicity. It requires three sequences that are arranged about the Beater. The Beater should be the tire. 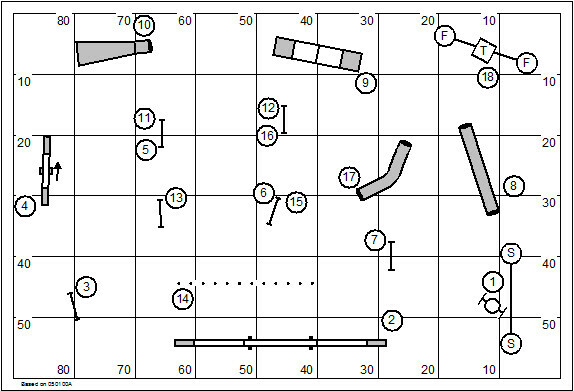 Other obstacles that are not involved in scoring sequences are positioned about the course mostly to confound the team. These are Bludgers. Often these Bludgers are positioned in that transition from a scoring sequence to the Beater. And so the dog’s path might take on a snookeresque quality and is the true test in the handler’s canny ability to manage the movement of his dog. Use the same course for dogs competing at all levels. The level at which the dog qualifies depends upon the number of points earned. Games II might also be required to send from a well-defined containment line; and possibly even Games I. However, Games I typically doesn’t need this complication. The scoring sequences are unnumbered. The dog may be directed to do each of the obstacles in that sequence in any order. Note that a Bludger is not faulted between the Beater and any scoring sequence. Consequently, the handler may choose to direct his dog over an obstacle that is not a part of the intended scoring sequence before beginning it. Rules for performance respective to the dog’s level will be applied in judging the scoring sequences. That means (not to be exhaustive) the weave poles should be judged by level, and the contact obstacles by level. Be aware that you will be judging the tire for refusals after the completion of a scoring sequence. Understand how to judge Bludgers. 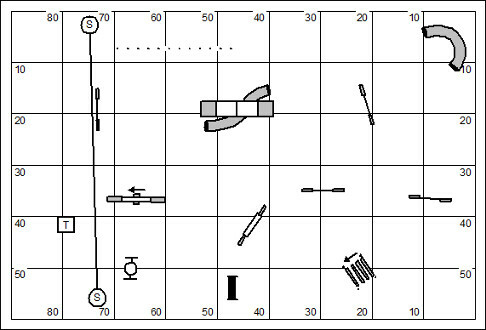 A wrong course obstacle is only significant when the dog has freshly completed a scoring sequence and is approaching the Beater or, as in a standard course, taking a wrong course obstacle after beginning one of the scoring sequences. A skillful handler may direct his dog over obstacles for flow from the start line or after performance of a Beater. * Houses of Hogwarts variation ~ In this variation there are four sequences, rather than only three. Typically on the course map the judge will assign both the name of the house and the value of the sequence: Gryffindor 25, Slytherin 25, Hufflepuff 20, and Ravenclaw 15. If a team completes or attempts one sequence more than once the final score for the team will be zero. Each obstacle has individual point values that are earned by a team if a sequence is only partially completed prior to time expiring. The application of individual obstacle values can be ignored in routine competition in Quidditch. It really is not possible for the dog to qualify if all three sequences are not completed. However, in competitions like the TDAA’s Petit Prix this accounting method should be used because the last smattering of points earned will give additional differentiation for placement within the field. Remember that Bludgers are significant only when you’re done with a scoring sequence and on the way to the Beater. Sometimes it might be desirable to take an obstacle for flow to move from one part of the field to another. Even if the dog offers performance of an obstacle when you’re making a transition across the field you should not waste time will silly call-offs. It’s better to take the flow and go. The attempt of the Beater is a distance challenge. Give yourself room to move well. And, you don’t always have to look at it as a raw send (with your toes to the line, flapping your arms). It might be solved with you moving parallel to the dog, but at enough distance to stay on your side of the containment drawn by the judge. Also, remember that the Beater is not tied to the scoring sequence. If your Beater fails… you need to go on to the next scoring sequence. The game will be won, and possibly the Keeper bonus earned, if your strategy gives your dog the most efficient possible path. Beware of long unproductive transition between scoring opportunities. Your analysis of the scoring sequences must include both the approach to the Beater (and awareness of Bludgers) and the flow from the Beater to the next scoring sequence, or to the table to end time. Make your dog’s movement as smooth and logical as possible. In this variation of the game the dog is naturally the Quaffle. But for the sake of clarity, we’ll just call him a dog. If we were to be true to the original game envisioned by J.K. Rowling, the Bludger would be a stick, and stewards might be assigned to whack the handler as he attempts to direct his dog to the Beater. At the end of the day, we decided to forgo this definition of the Bludger. The TDAA seeks a balance in the types of games played in the Petit Prix, our national tournament. Heinz 57, described in some detail below, is a relatively simple game that is a test of the steadiness of the dog and handler team. It is a game of arithmetic, a simple calculation of obstacle values, multiplied by two along the way, to arrive at precisely 57 points. A dog who faults an obstacle is not lost! However the handler had better be very capable of recalculating his arithmetic on the run. This is a continuing series that provides a careful analysis of the games to be played at the 2012 Petit Prix. The 2012 Petit Prix will be run in two regions. All winners from either venue will be recognized as our national champions for 2012. A dog may compete in either tournament; or both. Heinz 57 is the invention of Bud and Marsha Houston. The premise for the invention of the game was silly enough… they started with the name of the game and made up the game to fit the name. It turns out to be an interesting application of math to solve the qualifying criteria. Obstacles can be taken twice for points; back-to-back performances are never allowed. Another obstacle must be performed before the dog can be redirected to an obstacle (whether or not it was faulted). The collapsed tunnel has a special value, it is a doubling obstacle. The collapsed tunnel can be taken twice; and cannot be taken back-to-back. With the exception of jumps, if a dog commits to any obstacle with four paws he is required to complete the performance that obstacle, whether or not it is faulted. A faulted obstacle may be repeated, but only after another obstacle has been attempted. The table marks the finish of the course. The table becomes live after the dog has earned one point (the Mr. Banks rule). The handler should exercise caution when directing the dog to obstacles near the table because if the dog gets on, then scoring ceases, without regard to the handler’s intentions. Heinz 57 is scored points then time. 57 points is the benchmark. Any amount over or under 57 will be subtracted from 57 to determine the dog’s final score. Time is a tie-breaker only; but in a game like this time is a very important tie-breaker. Heinz 57 requires a random distribution of unnumbered obstacles. 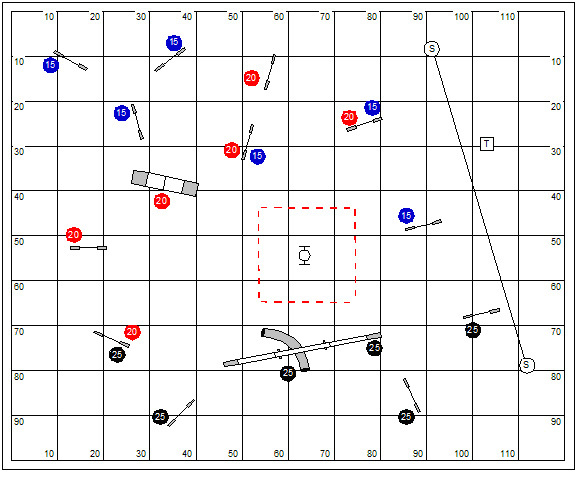 It is a game that could easily be nested from the set of equipment another game or course with little equipment movement. 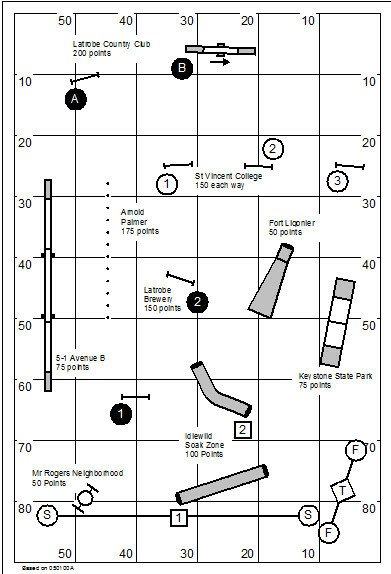 This Heinz 57 course was put up as a Team Gambler in a USDAA Dog Agility Masters Tournament. The course is closely nested with a Masters standard class previously run. You’ll note in this design the collapsed tunnel is placed at considerable distance from the table. The handler’s strategy for point accumulation will have to carefully account for obstacles to be taken, or avoided, moving from the second performance of the doubling obstacle to the table. In a kindly course design the handler should be coming out of the collapsed tunnel with 56 points… anything more than 1 more point will NQ the team. The judge’s design might place the chute in a friendly position towards the front of the ring, providing for a one-point obstacle on the way to the finish. This course was designed to easily pick up one final point at the end of play and head for the table to end time. This TDAA course illustrates: as the point accumulation can be quite modest Heinz 57 can be played in a relatively few obstacles and in a small space. This Heinz 57 course, also a teacup design, has placed the collapsed tunnel at a considerable distance from the table with a lot of obstacles between the tunnel and the table. The riddle isn’t quite as easy as it looks, as the dog needs to earn an odd number of points before getting to the table. The essential strategy of Heinz 57 is to find the most efficient path that scores the required number of points in the least amount of time. The game will surely be won by the best time to the table or finish line. Heinz 57 is a game of arithmetic. The scoring mantra is “13 & Double, 2 and Double, 1 and Done”. This math outlines the strategy for the game when the kindly judge makes it an easy matter to pick up a single point and get to the table without terrible conflict. On the other hand, the course could put the collapsed tunnel at some distance from the finish. This can be a test of skill, and canny handling, for the handler to bring his dog out of the chute with a number of points that is balanced with the value of a closing sequence of obstacles. It’s important to acknowledge that coming out of the tunnel (the doubling obstacle) the score of the dog will always be an even number. That means the accumulation to the table will have to be an odd number to get to 57. It’s nearly impossible to run this game in a willy-nilly fashion, doing the required math as you run. And so the handler should seek a strategy that is as fixed and sure as though it were a numbered course. Recovering from error will be the real test of the handler’s mettle. 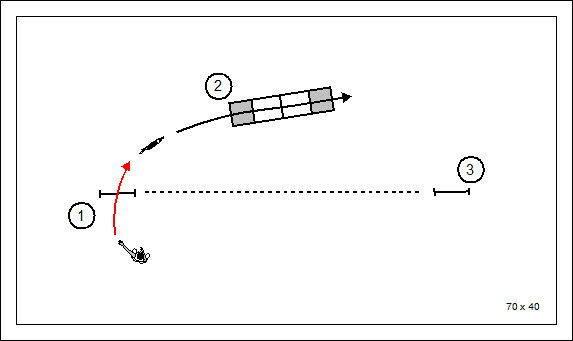 If the dog drops a bar before the first double, the handler should find a way to make up the point as he works, keeping in mind that the “make-up” should be one point before the first double; two points after the first double; and four points after the second double. If a dog faults an obstacle the judge should call fault simply as advice to the handler that his dog did not earn the point value for that obstacle. Be mindful that the dog is required to attempt the performance of another obstacle before returning to the faulted obstacle. However, dropped bars will not be reset and the jump with a downed bar will have no value. Note that “fluffing” the chute of the collapsed tunnel will be problematic as the two doubles should come in rapid succession. Be alert to a problem of twisted fabric, which may be caused by the wind in an out-of-doors trial, or by the yaw of the dog in the performance. The judge might quickly step in to give the corner of the chute a tug to straighten it out. In dire circumstance the judge could halt play to prevent a twisted chute from being dangerous to the dog. Heinz 57 is a strategic dog’s choice point accumulation game. The purpose of the game is to score exactly 57 points using a doubling obstacle (usually the collapsed tunnel). Heinz 57 is scored Points, Then Time. 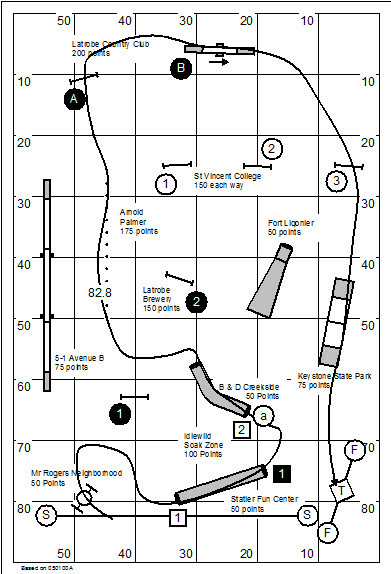 Alternate doubling obstacle ~ the judge/course designer might specify an alternate doubling obstacle for Heinz 57. Original Rules ~ The following rules have been amended or removed from play of Heinz 57:JFF rules will be used for performance faults. For example, no specific faults are associated with the weave poles. However, any error must be fixed or the dog will not earn points for the obstacle.With the exception of jumps, if a dog commits to any obstacle he is required to reattempt that obstacle until it is not faulted to keep the handler from doing something unsafe for the dog should the dog volunteer for an obstacle unaccounted for by the handler’s strategy. No new points will be awarded until that obstacle has been performed. We decided this year that the top 40 players at each Petit Prix should win commemorative apparel. We settled on a high-quality fleece vest that is American made. Marsha and I both are huge advocates of buying American products whenever we have the choice. How the vests will be awarded put us momentarily into a quandary. In the final round of the Petit Prix the top 40 players will be set aside to run last, by jump height, in showcase fashion. The difficulty is that, after the dust settles, it’s possible that the 40 players on the floor will not own the top 40 scores. Remember that this is a new format for the Petit Prix; every player will play every game and earn placement points against the field. What we’ve decided on is this… the Champions’ Vests will not be given out before the showcase round. They will be given to the top 40 winners after all dogs have run, as part of the awards ceremony. In case you are wondering there will be only one vest to an individual handler, regardless of how many dogs that handler placed in the top 40 dogs. The cost is maybe four times what we might have done; a lower quality item manufactured by child labor in Malaysia. The games we’ll play are described in this series. For additional information and sample courses refer to The Book of Agility Games at www.dogagility.org/newstore. Named after the old television game of the 50s and 60s, What’s My Line? presents the obstacle course in the form of a puzzle. The game provides all handlers the opportunity to come up with a strategy for running the most efficient course possible. In the U.K., this game is known as Take Your Own Line. The objective of What’s My Line is to perform all of the obstacles on the field without repeating or omitting any or omitting any, as quickly as possible. The handler earns one point for each obstacle his dog performs successfully. Each obstacle has the same value, regardless of the difficulty of performance and regardless of the number assigned to the obstacle. If an obstacle is performed twice, the dog will lose a point for the performance. If an obstacle is faulted, the team will receive no point for that obstacle. Further, the obstacle will be counted as used/completed. So the dog would earn an additional fault if the obstacle is repeated. A four-paw commitment to a contact obstacle will commit the dog to the performance of that obstacle. Under this rule, if a dog commits to a contact obstacle with all four-paws, then bails off, he has committed to that obstacle. While the on-and-off refusal will not be faulted, the dog must be directed to finish the contact obstacle. Time will be started and stopped at points designated by the judge. A maximum course time can be applied at the discretion of the judge. What’s My Line is scored Points, Then Time. Time is a tie-breaker only. The team with the most points will win. Performance faults might be based on any rational system. 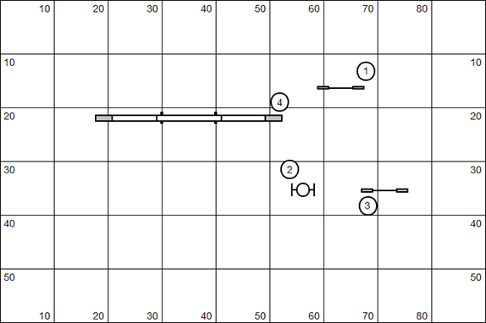 What’s My Line uses obstacles laid out in a random pattern on the field, without numbers, and with no suggested course flow. What’s My Line can be played on virtually any configuration of obstacles. It is an ideal game to nest with another game or standard course so that only a minimal amount of tweaking of the obstacles is required. This What’s My Line course is based on an existing numbered sequence. You can see it here: http://wp.me/pmSZZ-15p. This set of the field has a nice elegant solution, or two. Note that neither the start of the finish is constrained to a small area or single obstacle. This allows for a variety of possible solutions. 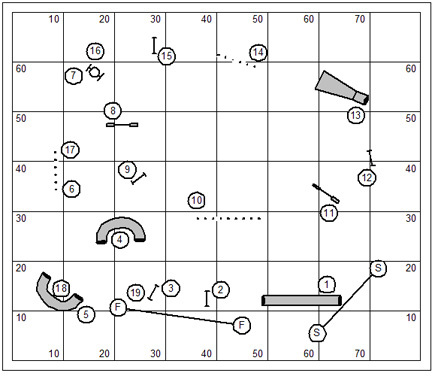 Course design may also be approached as a puzzle intentionally designed for What’s My Line. This design challenges the participants to see the lines and flow that might be less obvious. 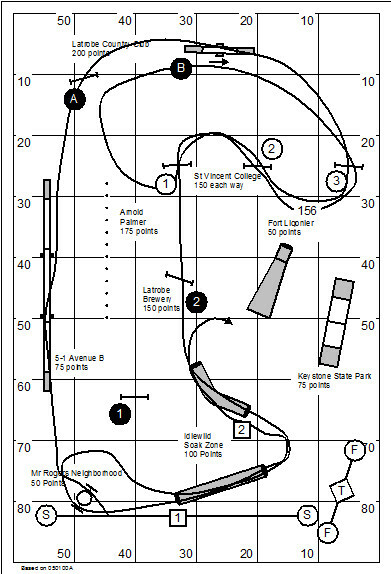 The course designer should avoid big obvious loops that solve the riddle of order and direction. The riddle should be more like a puzzle. Qualification should be based on the number of obstacles on the course. At the Masters/ Superior level the dog should earn all points; and only slightly fewer points should be required for lower levels. A kinder judge might back these point requirements down by a single point. Obstacles may be numbered at the judge’s discretion. These numbers are for the judge’s reference only and in no way suggest a sequence for running the course. The advantage of numbering the obstacles is that the judge simply accounts for each obstacle performed; the bodies will be sorted out at the score-keeping table (meaning that the score-keeper will analyze the numbers for completeness of the mission, repeated obstacles, and so forth). Note that any game that requires the judge to yell out numbers lends itself to scribing errors. Rather than numbering obstacles the judge might use the Mind Like a Steel Trap method for keeping track of accounting for the dog’s path. In this method is the judge’s responsibility to call the fault when an obstacle is repeated. The judge could signal one point for each obstacle performed or could inform the scribe of the total number after the dog has run. Never Cross the Line variation – In this variation, invented by Helix Fairweather, in addition to the stipulation that the dog cannot repeat any obstacle, he is not allowed to cross his own line (meaning, no crossing patterns). 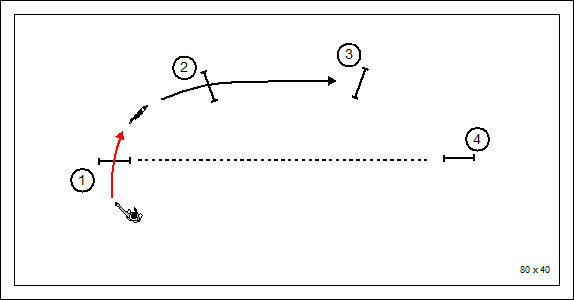 This is an example of Helix Fairweather’s “Never Cross the Line” variation. The dog is required to do all of the obstacles without repeating any, with the additional stipulation that he’s not allowed to cross his own path. Zero Value Obstacle – The judge mentions the zero value of the obstacle in the general briefing. Whether the handler directs his dog to perform the obstacle depends upon whether he was paying attention in the briefing or whether he wants to give the dog time on the obstacle as a warm-up for a later class. There is no penalty for the dog performing the zero-valued obstacle. Frequently, the valueless obstacle is the dogwalk. Scoring variation – Another scoring variation is to award the obstacle point values as in Gamblers, instead of just 1 point. More difficult numbers are assigned to the more difficult obstacles. The more obstacles on course, the higher the maximum possible score. This assignment of numbers might affect the handler’s strategy, as the handler might attempt the higher point values earlier in the solution to the course. The handler’s job is obviously to find the most economical path for the dog to perform all of the obstacles. The handler should be ingenious in looking for lines through the course, which should not be limited by vertical and horizontal lines. Diagonal lines in the course should also be considered. More important than finding a solution to the riddle is to find the shortest path that solves. Distance from the start line to the first obstacle and distance from the last obstacle to the finish line should be taken into consideration. Whenever possible use your handling skills and training foundation to steal a second or two from the competition. For example, if there is a moment in the course that requires a hard-aback turn after a jump, use your ability to pre-cue the turn or get an efficient wrapping turn to gain an advantage. 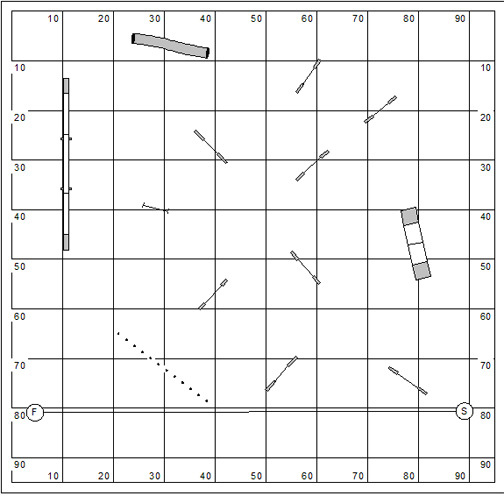 There was a real attempt in the selection of games for the 2012 Petit Prix to offer a balance of different games that test the skills of a team in sequencing, strategy, distance, and consistency. The final round will be Jumpers, a fast and furious sequencing game. Note that in a real departure from the format of any previous Petit Prix, the accumulated score from the entire tournament are held by the dog without being washed away. Our national champions will be determined by their earned aggregate score. The significance of this, please note, is that a dog can lose the final round… but win the tournament! Call, Direct & Send is a numbered course that features the three distance challenges that give the game its name. This original AKC game is the invention of Will Koukkari and Sharon Anderson. Call, Direct & Send was once considered by the AKC as a “distance” game that might have become a part of the suite of required titling games. But this game was abandoned. Ultimately the AKC moved to the game FAST as the feature distance game. In Call, Direct & Send the dog and handler team are challenged to solve three distance riddles on a numbered course. The three distance challenges that give the game its name include: a Call over one to three obstacles; a Direct or mid-course distance challenge of two to five obstacles; and a Send over two to three obstacles to close out the game. 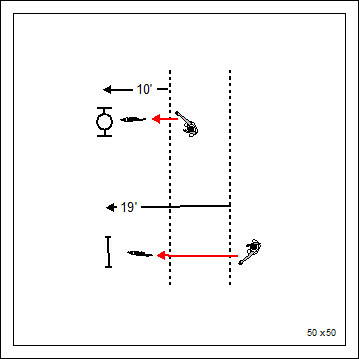 In Call, Direct & Send, boundaries are drawn to indicate an area into which the handler may not advance while the dog performs obstacles at a distance. Otherwise, the dog should follow the numbers. For each distance challenge successfully completed the dog earns 10 points. The scoring basis for this game is Time+Faults-Bonus. Call – The Call is a lead-off at the start line, requiring the handler to call the dog over the opening obstacles. In the Call the dog is placed on a Stay at the beginning of the course while the handler leads out to a point on the course designated by the judge. The handler must then call the dog over the initial obstacles and continue on course. 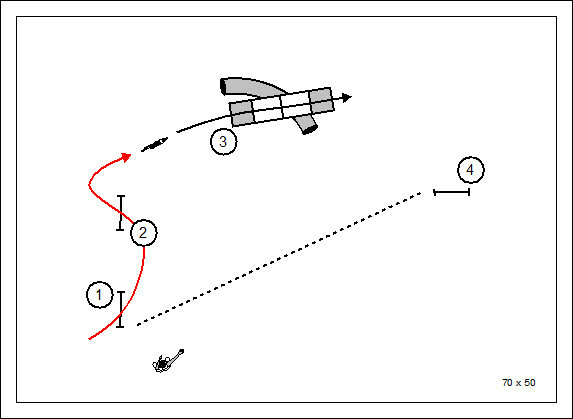 Direct – The Direct is a mid-course gamble sequence in which the dog will be required to work at a distance from his handler. The handler must direct the dog over the sequence of obstacles without crossing a containment line indicated by the judge and continue on course. Send – The Send is the final gamble challenge. The handler sends the dog to perform the finishing obstacles while working at a distance from the dog in an area designated by the judge. This sample Call, Direct & Send course is based on an Excellent JWW course designed by AKC judge Melinda Harvey at Oriole DTC on April 18, 1999. Call, Direct & Send is scored Time+Faults-Bonus. The team with the highest score wins. While traditionally Call, Direct & Send (CDS) was a Jumpers game, often including weave poles, the game has evolved over the years to include technical obstacles. It’s likely that this was an evolution of convenience as it allows CDS to be nested with standard courses. Call, Direct & Send is not a standard course! That means that there are no required obstacles and there is no required number of obstacles, by class, as there is in the standard classes. This affords the course designer the leisure to design something lean, and to the point. That is the essence of the game. This course is fairly business-like in getting the three distance challenges done. The Call features a longish lead-out, by TDAA standards. The Call doesn’t really have to be anything tricky. It is intended to demonstrate whether the dog will stay for a modest lead-out. In the Direct¸ from #4 to #6, the containment lines might seem generous. It is a riddle none‑the‑less and might not be as easy as it seems. The Send, from just behind #12 to #13, is the end of the course. This closing gives a long straight lane of approach on both sides of the sequence. It is an honest test of the handler’s ability to send his dog straight-away over obstacles at a modest distance. One of the most common errors in course design is approaching a distance challenge with a disturbed dog’s path or an intrusive handling moment. Allow the dog to flow into the gamble. Or, if you really want to make it a handling moment, at least provide enough real estate for the handler to demonstrate that he understands your riddle. This discussion might suggest that the course designer’s objective in Call, Direct & Send is to dumb-down the challenge and make everything as simple as possible. That should never be your objective. But remember this, if you have never walked on the moon yourself, please don’t try to give us lessons. Note that there’s a real opportunity to design a course that runs fast and gets you through the day quickly. Call, Direct & Send should not be a marathon. A dog earning a score equal to or less than the Qualifying Course Time (QCT) will earn a qualifying score. The third column shows what would be the SCT if the correct rates of travel are applied. The QCT for this game, however, is reflected in column four. These numbers incorporate an “expectation for success”. 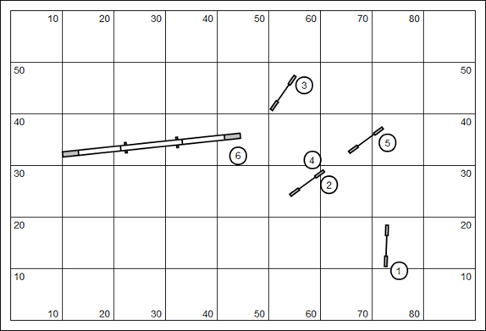 GI gets a QCT reduced by 10 points, anticipating that they’ll solve at least one of the distance challenges; GI gets a QCT reduced by 20 points, anticipating that they’ll solve at least two of the distance challenges; GIII gets the bad news, a QCT reduced by 30 points, anticipating that they’ll solve all of the distance challenges. These numbers aren’t as onerous as they might sound. If the GII big dog, for example, runs the course in 29 seconds, but solves only one of the distance challenges. He’ll still qualify because his time, less the 10 point bonus, gives the qualifying score. Please note that the table above is based on TDAA rates of travel, and TDAA jump heights. The judge should determine in advance how he will signal earned bonuses to the scribe. It might be a simple authoritative announcement of “Bonus!” Or, it might be an arm signal. Note that this game should be judged using the rules for performance respective to the dog’s level. The weave poles, for example, might be judged differently for every class/level. And any contact obstacle would be judged for refusals for the higher levels; and possibly with a four-paw safety rule for Beginner/Novice. It is possible for all levels to share the same briefing, and even walk the course at the same time. The real differentiation between classes will be the rates of travel and the qualifying criteria. The course itself can be the same for all levels. However, it’s common enough for the judge to draw different containment lines for different levels. The judge needs a position on course to get a clear view of the containment lines. A gamble or distance challenge succeeds only when the handler stays on his side of the line, and the obstacles are performed without fault (dropped bar, wrong course, missed contact and so forth). The judge should determine early how he or she will deal with people who return to their dogs at the beginning of the course to put the dog back in position for breaking a Stay. The tradition in the game is that when the handler leaves his dog the test has begun, and returning to the dog will negate the gamble bonus. While the rules have morphed by play in other agility organization that actually play Call Direct & Send, it’s worth noting what were the rules of the game as it was played in the AKC. These are presented without warrant below. Scoring is based upon a 100 point system, 100 being perfect. Faults are deducted from the 100 points. 85 points are required to qualify. Time is used as a tiebreaker. Call, Direct & Send is scored Points, Then Time. The team with the highest score wins. Each refusal is faulted 5 points. In the Novice class, three refusals will be scored Elimination. In the Open class, two refusals will be scored elimination. In the Excellent class, one refusal will be scored elimination. (Note: An improper entry or missed weave pole in AKC is scored a refusal). Each off course is faulted 5 points. Three off courses in any class will be scored elimination. A knocked bar is scored elimination. If the handler steps on or over any containment line while the dog is performing the indicated obstacles, the dog will earn a failure to perform. Failure to perform any obstacle is scored elimination. 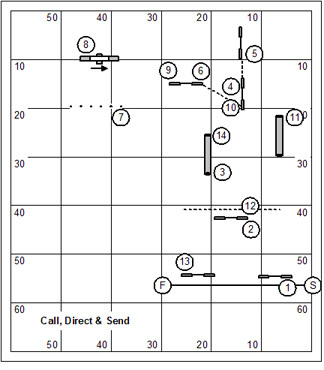 Failure to perform any of the three distance elements (Call, Direct, or Send) will be scored elimination. This includes stepping on or crossing the containment line. All other performance faults will be applied as in the Standard classes, respective to the level of the dog. 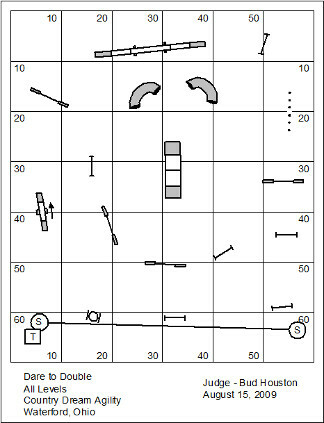 Course Design ~ The typical Call, Direct & Send course will consist of jumps, tunnels, and weave poles. The contact obstacles are not used. A dog trainer who has given good focus to distance skills in the dog’s training foundation will have a pretty good idea about possibilities for success in a distance challenge or gamble. Know thy dog! If the handler believes that the attempt of a distance challenge will likely fail and will certainly cost more time and frustration than it is worth… then the clever handler will decide in advance to forego the bonus and just run his dog through the sequence. The differential for the bonus might be made up in the dog’s speed in the overall course. Also, if competing in the TDAA’s Petit Prix (for example) the dog is accumulating a back-ground score for placement within the field. So even if the dog doesn’t qualify he’ll not be set back so far. Good distance work has very little to do with standing still. Aside from the Call, the handler is more likely to have success with the distance challenges by applying the pressure of movement, while at a distance, and while honoring the containment lines of the course. The riddle of the distance challenge is in balancing the efficacy of movement against the placement of containment lines. There is an excellent series of eBooks for distance training available: The Joker’s Notebook, issues #0 through #4, available at www.dogagility.org/newstore. It used to be I could click on an obstacle or object on the course map, or select a group, and then nudge them in 1′ increments using the arrow keys. This was very useful for getting exactly the desired measured distance between obstacles, while maintaining the alignment of obstacles. Unfortunately in this new release the obstacles are locked to the underlying grid. And so, they will no longer nudge. I will move my continuing notes on the Clean Run Course Designer v4 to a page on my blog, where I will continue to store notes. Ultimately I’ll point the developer/Glen Kime to that page in case he has any interest in usage notes to be taken into consideration for future mods and releases. That page is here: http://wp.me/PmSZZ-15B. In addition to three standard classes, the Petit Prix will consist of seven games. The games we’ll play are described in this series. For additional information and sample courses refer to the The Book of Agility Games at www.dogagility.org/newstore. The objective of this series is to explore the games of the 2012 Petit Prix both to understand the basic rules of each game and to explore competitive strategies for each. 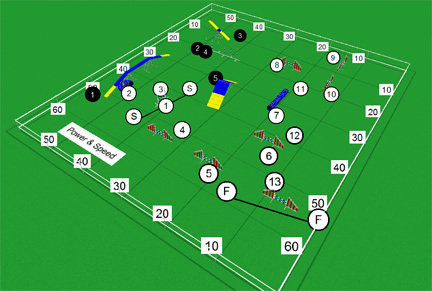 Power and Speed, a British import game, is the Iron Dog competition of dog agility games. The game demonstrates the ability of the handler to exercise tight control (power) through a part of the course, then show loose control (speed) over another part of the course. Each handler and dog runs a course that is split into two sections: Power and Speed. Power – The Power section typically consists of technical obstacles; contacts, and weave poles. The Power section may also contain spread hurdles or other specialty hurdles. The Power section is un-timed. Consequently the start-line is positioned between the last obstacle of the Power section and the first obstacle of the Speed section. If the time is getting close to the course time the timer is instructed to watch the dog. If the dog’s time exceeds the course time, the dog will still be allowed to continue on the Speed section, but there will be no score awarded. Any faults earned by the dog will be added to the dog’s score. For example, if the dog misses a contact or earns a refusal on a contact obstacle, his score would be 5 for the Power section. Obviously, the ideal score for the Power section is 0. 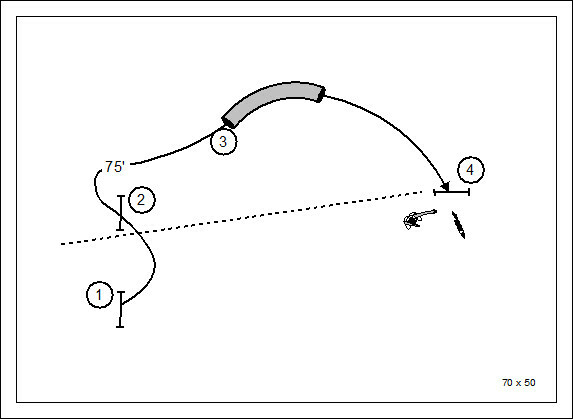 Speed – The Speed section contains a straightforward Jumpers sequence. The goal is for the dog to run the course as fast as possible, preferably with no faults. 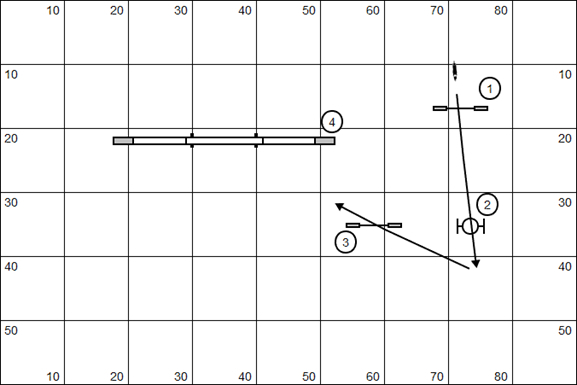 Scoring for Power and Speed is Time, Plus Faults: faults from the Power section plus time from the Speed section plus faults from the Speed section. The dog with the lowest score wins. Power and Speed is judged under the performance rules respective to the venue, and level or class of the dog in competition. The qualifying score for Power and Speed is based on the measured length of the Speed section using rates of travel appropriate to the level of the dog’s in competition. Time-Plus-Faults equal to or less than the SCT will earn a qualifying score. As the Power section of Power and Speed is not timed, the handler should not be in a rush to complete that section. When the “Speed” element of the game begins, the handler should push for the best possible speed and a smooth and flowing finish. A common error in Power and Speed is for the handler to rush from the Power section into the Speed section without taking advantage of the fact that time does not begin until on the approach to the Speed section. With this in mind the handler should take careful note of where the start-line is drawn. And if a lead-out from the dog is desirable the handler should leave the dog in a stay and take the lead-out advantage. A clever host club will put Power and Speed as one of the first classes in a weekend trial so that this class can be used both for obstacle familiarization. With the contact obstacles especially the handler can work at a moderate and calculated speed, reminding the dog of his job on every contact. That careful approach to this competition could benefit the dog’s performance on contacts through the entire weekend. In the Speed section the handler should be aware that the clock has begun ticking. This is the time for bold and aggressive handling. Go for the gusto. As with all games in the Petit Prix, if something goes wrong you should pick yourself up and go on. Even though errors might cause your dog to not earn a qualifying score; it’s not all about qualifying. You are being measured against the field earning a score that continues to accumulate in background scoring. If you give up and leave the field ignominiously, then your dog will have a score of zero which, in the long run, is not highly desirable. Style and Sprint variation – This refinement of Power and Speed allows a generous but finite limit on the Power course to limit the obedience interruptions, downing and staying the dog between obstacles. Enough time should be allowed to do the Power course carefully, but not so much that the section becomes a protracted stalling drag.When this variation is used timing for the Power course alone will be required. This time-keeper will be required to blow a whistle, dismissing the dog, if the time is exceeded before beginning the Speed course. A 5 second warning whistle might be employed to give the handler the last gasp of a chance to get going. Death Penalty ~ In this variation any fault in the Power section of the course results in elimination and immediate dismissal. While this is the early tradition, the game has evolved to be more kindly application of faults, deferring instead to an overall Time-Plus-Faults scoring basis. Power and Speed is a two part game. In the first part [Power] the dog will run an un‑timed sequence of mostly technical obstacles; and in the second part [Speed] the dog will run a timed jumpers course. Power and Speed is scored Time, Plus Faults. The thing I’m most excited about in this new version of the Clean Run Course Designer is that it supports TDAA equipment. Having real 16″ diameter tunnels is great. I’ve presented here a 3-D rendition of the Power and Speed course. 3-D is interesting and gives the rare perspective that you typically only see… after the course has been built with real equipment on the field. CRCD has a “Save As” feature in case you want to save the graphic in this perspective. The developer has provided a number of new tools for changing the viewer’s aspect on the course. I’ve played with these a little bit, but have not explored them completely. As usual the big numbers are over-whelming to the TDAA course. It would be great to be able to size numbers in the same way you size text. I went through a period where I sized my own text. Of course you lose the ability to use the robust renumbering tools and course reversal when you’re working with raw text.I’m wondering if it would be possible in some future release for the numbers to lie down on the field (and the grid markers) the same way that text does? Shaping the tunnel is different (therefore alien and annoying). I couldn’t figure it out at first. The designer has actually provided a little pop-up tutorial for grumpy old farts like me that provides guidance for how to shape the tunnel using the new tool. I’m a keystroke typist rather than a mouser. So a lot of the tasks that I like to do are programmed into my finger tips. CRCD4 unfortunately has changed some of the simple keystroke combinations to perform common tasks. For example, previously to copy a course map you would type [Alt-E] then “C” (for Copy). CRCD4 has morphed this combination to [Alt-E] then “y” (for copY).However, [Ctrl-C] still works for the copy command. CRCD4 has re-introduced a keystroke for course size. The keystroke was unavailable in CRCD3. This is good, as it is a common task when designing courses for a wide variety of spaces.